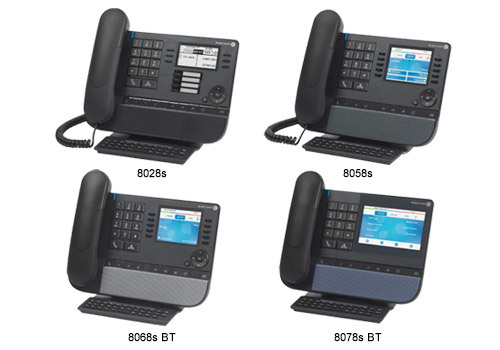 The Alcatel-Lucent 8078s, 8068s, 8058s, 8028s Premium DeskPhone s Series delivers improved performance and innovative design. These new variants enhance the IP communications experience in multi-device environments, bringing conversation comfort to the next level with audio quality improvements. Enhanced High Definition voice provides a superior audio experience with natural voice communication and improved intelligibility, enabling increased business user productivity. Alcatel-Lucent Enterprise servers or Third-Party SIP telephony platforms. The Premium DeskPhone s Series improves the overall energy efficiency of IP phone deployments by saving energy in standby mode and in conversation mode. The Premium DeskPhone is now the hub of enterprise connected devices, offering broader connectivity options for Smartphone integration, and new applications based on proximity detection or location.